12inX10yd ROLL WHITE Ships from NH only. 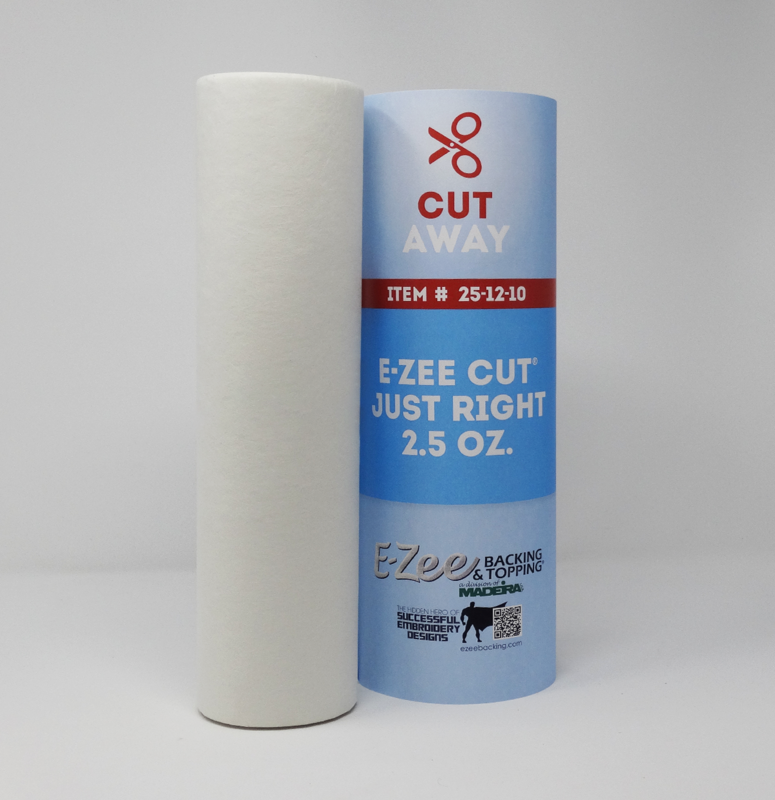 E-Zee Cut® Just Right 2.5 ounce is a medium weight, Cut Away stabilizer. It has a soft hand and is great for use with medium stitch counts and medium density designs. This economical stabilizer works well with one or two pieces. Use with medium weight fleece, knits and stretchy fabrics. Cut Away backings should be used for unstable and knit fabrics. Cut a piece from a roll or use a piece of pre-cut to fit your hoop size. Hoop by placing the backing underneath the garment. Embroider the design and remove the embroidered item from the hoop. Trim the excess backing with a sharp pair of scissors or shears, leaving approximately ¼” around the outside of the design. Rounding the corners instead of leaving them square or pointed will avoid curling later on. To avoid nicking the fabric when trimming away the backing: Hold the backing while trimming and let the garment drape. Be sure to face it so you can see both the edge of the design and the fabric while you are trimming.